Regional Property Auctioneers (RPA) part of the Barnsdales Group of Companies are delighted to have sold a row of fishermnas cottages in Grimsby! After some spirited bidding the row of cottages sold for £225,000, £25,000 ahead of the guide price. A great catch for the buyer and a great result for the seller and RPA! 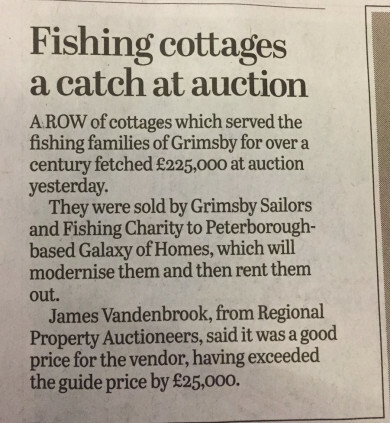 The article attached reports the sale in the Yorkshire Post!